"A Father's Dream" - the title of the DVD produced in 2004 - says everything about the congenial interplay between father and daughter. Martin Pyrker, who is already more than 40 years on stage, ignited in 1972 the Boogie Woogie enthusiasm in Austria and produced the first Austrian Boogie Woogie record "Boogie Woogie Session'76" together with Hans Georg Möller and Axel Zwingenberger, which even was played in the charts of the Austrian radio program. 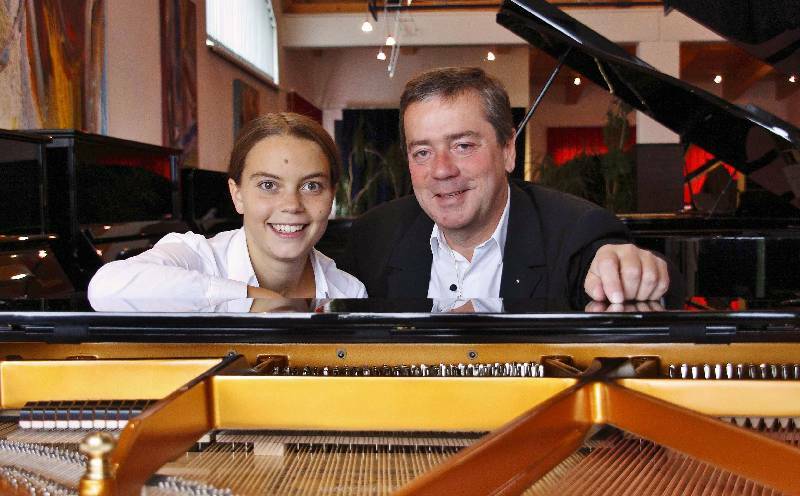 This was the beginning of a growing enthusiasm for this kind of music in Austria and Germany and influenced further generations of young pianists. More than 2000 performances and concerts, more than 100 own comopsitons and numerous tours (such as "Stars of Boogie Woogie") throughout Central Europe and the U.S. influenced since then Pyrker's musical career. with Dana Gillespie and Betty Semper, drummer of her band "The Rocking Birds", solo concerts with classical percussion as well as member in the famous group of Martin Grubinger "The Percussive Planet Ensemble" for many years. In their great demanded gigs with her father, she captivates the audience with professionalism, empathy and her charm. Each time it pulls the people off their seats when it states: "Drum the Boogie!"